Newtown Creek, the site of a massive oil spill, is one of the most polluted waterways in the United States. During its routine patrols of NYC waterways, Riverkeeper observed NYCON Supply Corporation, a major concrete manufacturer, dumping concrete waste into the Dutch Kills tributary of Newtown Creek without a required Clean Water Act permit. Riverkeeper also observed piles of gravel and layers of concrete covering the riverbed adjacent to the NYCON facility. On September 4, 2008, Riverkeeper and New York City Councilman Eric Gioia (D-Queens), Chair of the City Council Committee on Oversight and Investigations, announced legal action against NYCON, located in Long Island City, Queens, for violations of federal environmental laws. Riverkeeper filed a Notice of Intent to Sue NYCON. Riverkeeper and Gioia alleged that NYCON has been illegally discharging concrete waste without a permit into a tributary of the heavily polluted Newtown Creek, in violation of both the Clean Water Act and the Resource Conservation and Recovery Act (RCRA). Riverkeeper also alleged that the discharge of NYCON’s waste constitutes an imminent and substantial endangerment to health and environment under RCRA. Both the Clean Water Act and RCRA authorize citizen groups to sue polluters, subjecting potential violators to up to $32,500 in penalties per day per violation. 60 days after Riverkeeper and Gioia announced intent to sue, DEC took action against NYCON for illegal concrete dumping and announced that the Department of Environmental Conservation (DEC) will take legal action against NYCON. DEC Region 2 stepped in and filed its own complaint, alleging 23 separate causes of action against the company based on violations of the New York State Environmental Conservation Law. 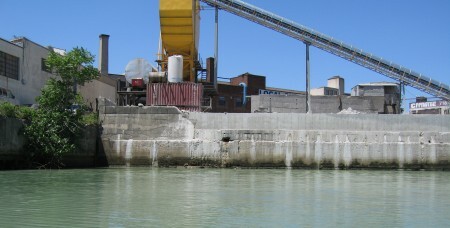 Based on investigations conducted by both Riverkeeper and DEC staff, the complaint alleges that, since at least 2006, NYCON Supply Company has been illegally discharging liquid concrete, cement-laden runoff, gravel, and other pollutants into the Dutch Kills, a tributary of Newtown Creek. This DEC action comes on the heels of a recent New York State appellate court decision that reinstated criminal indictments against another concrete company, Quality Concrete, also located on Newtown Creek. That decision reversed a lower court ruling dismissing the indictments against the company and one of its vice presidents and ordered that there was sufficient evidence presented to the grand jury to sustain the indictments. That case is currently being handled by the Brooklyn District Attorney’s office. Newtown Creek is a 3-mile long waterway that separates Brooklyn and Queens and is a tributary of the East River, the Hudson River, and New York Harbor. It is also the site of the 17- to 30-million-gallon Greenpoint oil spill – currently the center of numerous lawsuits against ExxonMobil by environmentalists, including Riverkeeper; lawmakers, including Councilman Gioia; and private citizens. Press Release – RvK and Councilman Eric Gioia Applaud State Enforcement Action Against Newtown Creek Polluter.